The building is a red and white vertically striped octagonal timber tower, 39 feet (12 m) high. The light is a white flash and is electric. Sources: NSLPS Database, List of Lights 1989, Gulf and River St. Lawrence Pilot, 1985. The engineer for the building of the light, which cost $3,489, was Joseph MacDonald. Originally it had a catatropic lens which was changed to a 4th order dioptric lens in 1966. The light was electrified in 1985. It is now solarized, automated and unwatched. 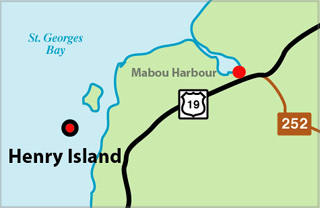 Henry Island has been privately owned since 1992. The lightkeeper's house, which had been completely vandalized has been restored to its original condition. The surrounding area has been cleared and grassed. The light is still maintained by the Canadian Coast Guard. 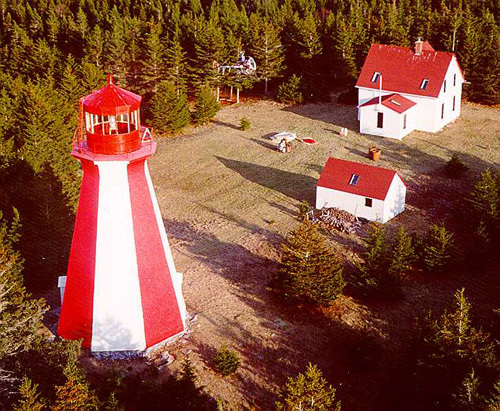 The island is maintained by the Henry Island Preservation Society, an Affiliate Member of the Nova Scotia Lighthouse Preservation Society. Trips can be made to the island by appointment. Landings are always weather permitting. Port Hood Island, NS, B0E 2W0. More about Henry Island Lighthouse on the Henry Island Preservation Society Website. The light is located on the summit of Henry Island.